Over in our Facebook group (where we now have over 656,000 members it keeps going up each week!) 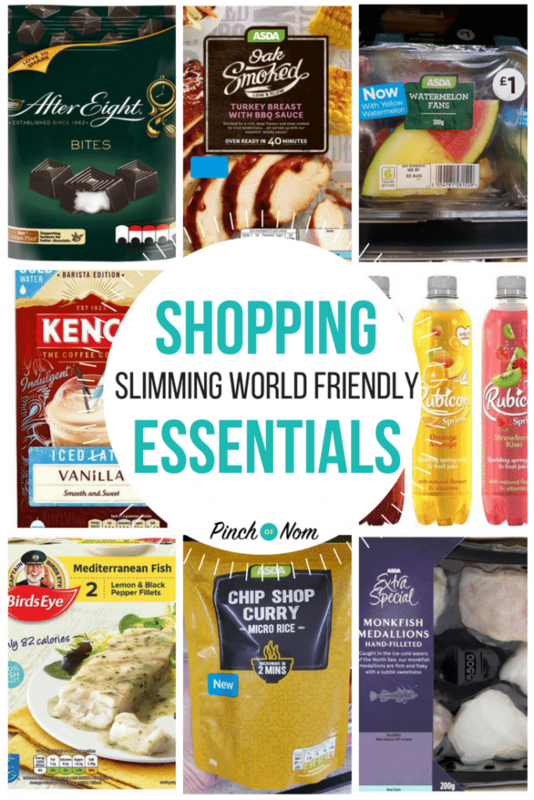 one of the hot topics of each week is spotting new products that are Slimming World friendly, for our New Slimming World Shopping Essentials list! Blackberries are one of those fruits that are often forgotten when thinking about Speed foods. I have a few bramble canes that grow wild in my garden, so I could just pick them, but the birds usually get there before me! 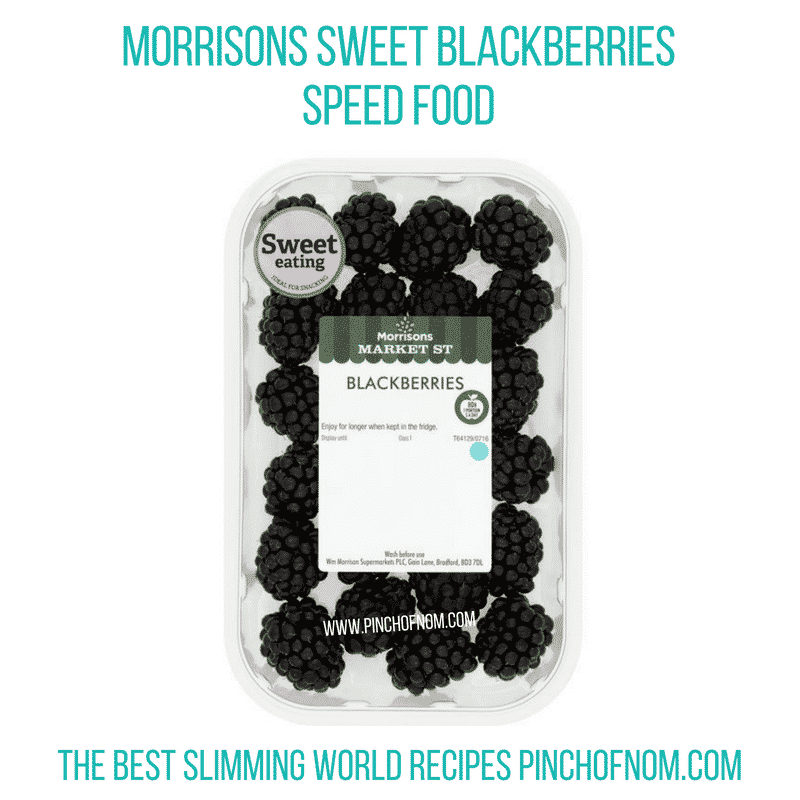 These Morrisons Sweet Blackberries are grown especially for their eating quality, so they’re ideal to eat straight from the pack after you’ve given them a rinse. 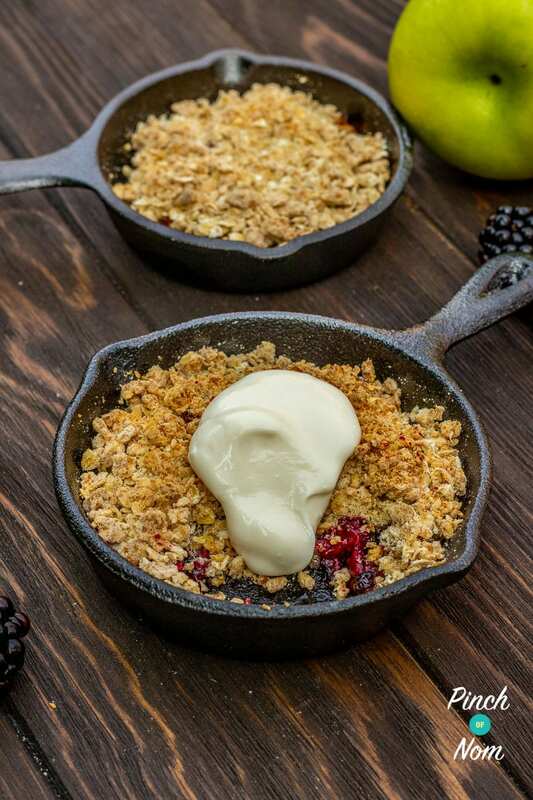 I’ll be using them to make our Low Syn Apple & Blackberry Crumble. Nom nom! However you choose to use them, you can buy them from Morrisons priced at £1.92 per 150g pack. If you thought watermelon had a dark green skin, you’d be correct. If you thought that the flesh inside was red…or pink…you’d be right too, but it can also be yellow, orange, green or white! 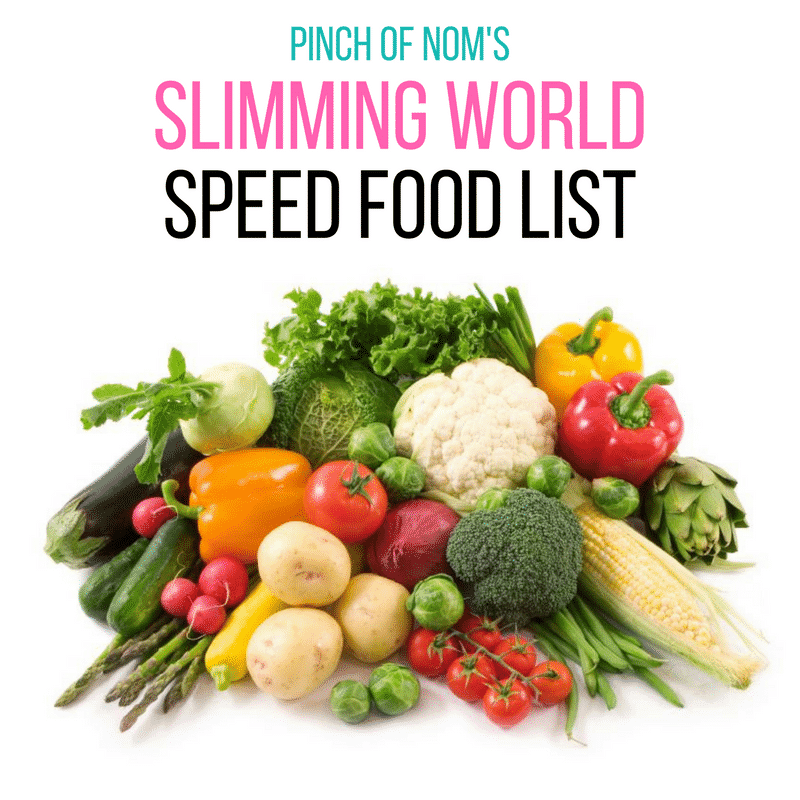 It’s a Speed food too! This new fresh fruit selection pack from Asda contains red and yellow watermelon. The yellow fleshed variety is sweeter, but both varieties contain plenty of vitamins, minerals and antioxidants and are very low in calories. 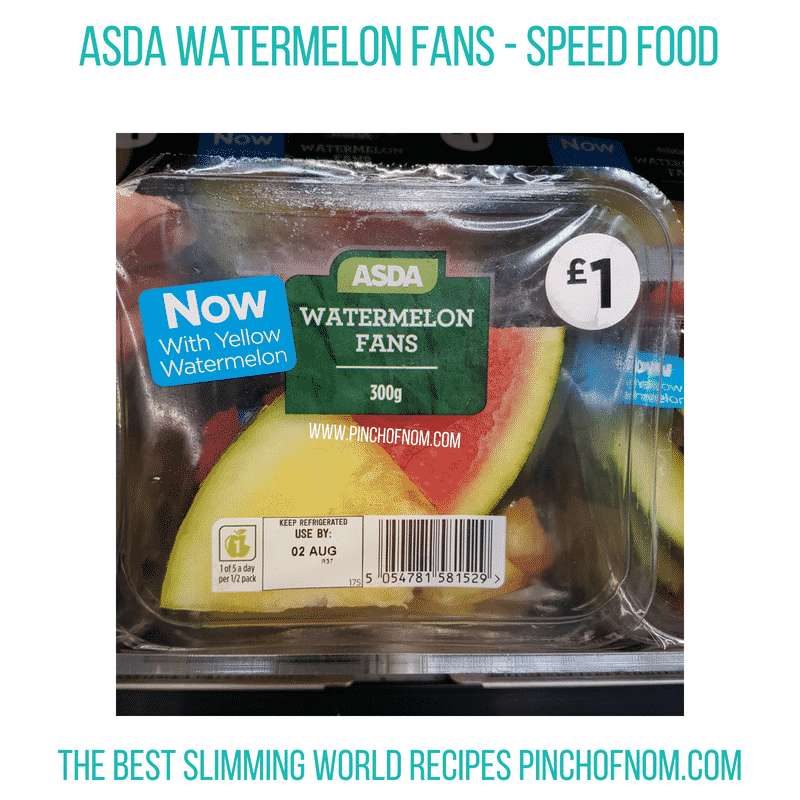 A 300g pack of Watermelon fans costs £1.00 in Asda. I love pasta! It’s a go-to meal when you’re short on time. Chuck some pasta in a pan of boiling water and it’s done by the time you’ve prepared something to serve with it. 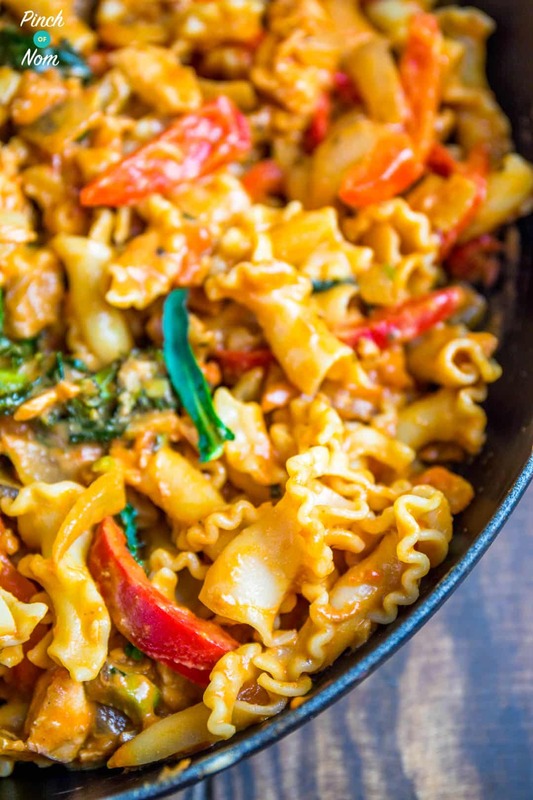 My favourite is this Syn Free Creamy Tomato Pasta from the website – so quick and easy to prepare and tastes soooo good! 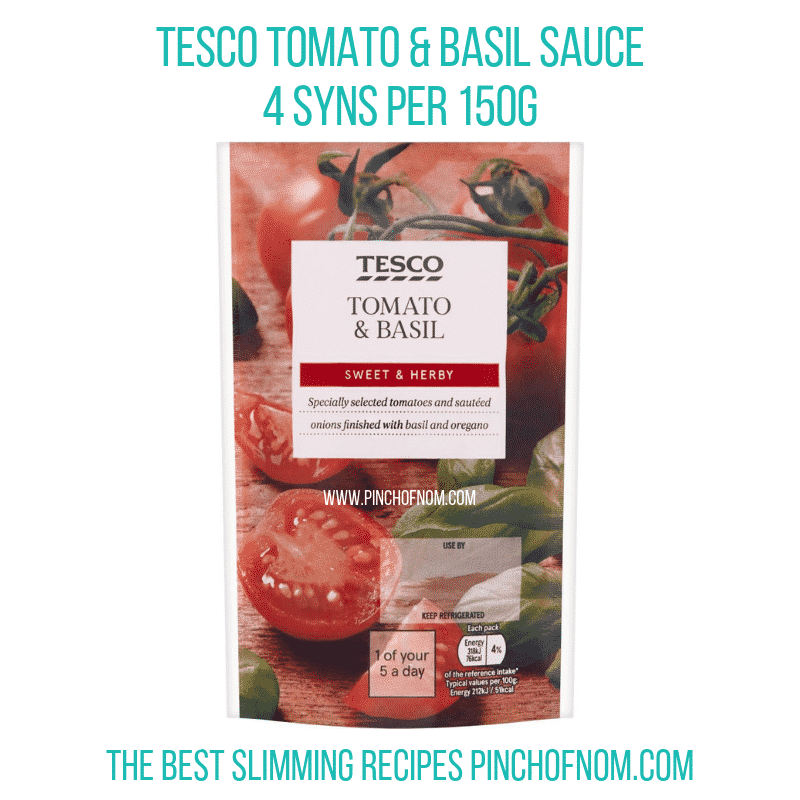 If time really is tight, Tesco have introduced this Tomato & Basil pasta sauce which is 4 Syns on the Syns Online app. It’s chilled, rather than ambient, so you’ll find it with the fresh pasta and sauces. This 150g pouch of Tomato & Basil sauce costs 85p from Tesco, You can find it here, on the Tesco website. 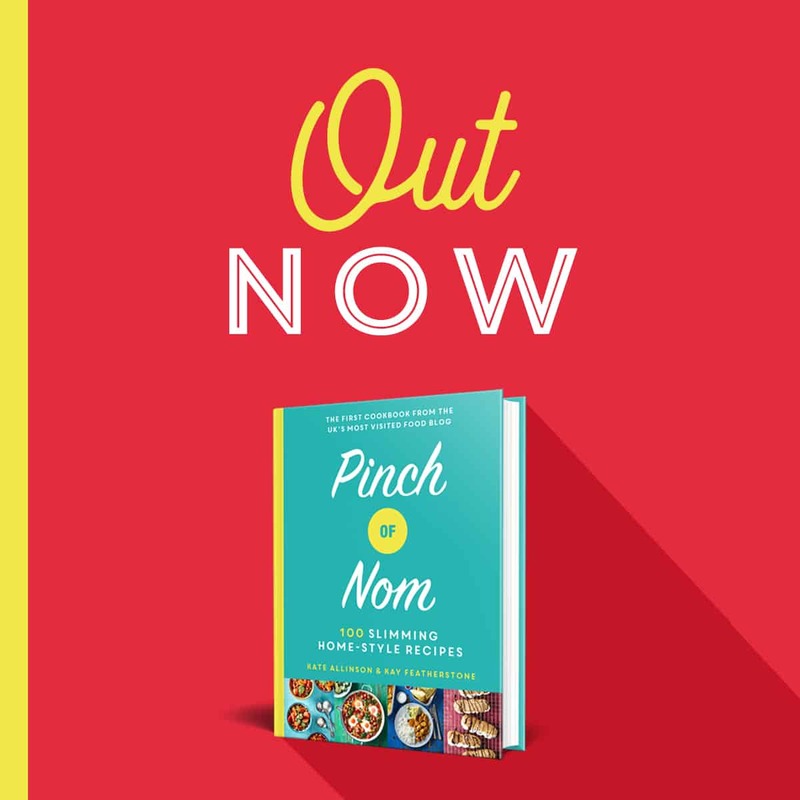 If you haven’t heard it previously, we have a mantra for fish recipes…’If it swims, it slims!’ We usually find that if we include a couple of fish recipes in our weekly meal plans it can contribute to a loss on the scales! 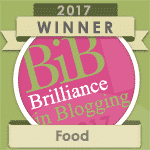 I’ve enjoyed the Birds Eye Mediterranean Tomato & Basil fish fillets many times whilst on my Slimming World journey. They’re handy to have in the freezer as a back up, so I was really pleased to find this new Lemon & Black pepper recipe in Asda this week. According to the Slimming World app they are 0.5 Syns per fillet. 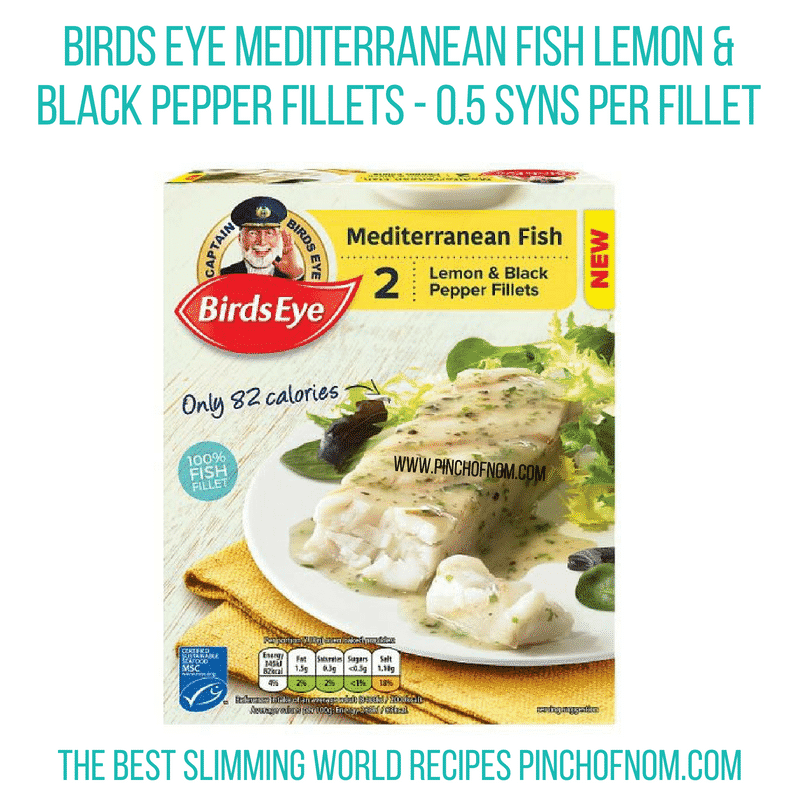 The Birds Eye Mediterranean Fish Lemon & Black Pepper fillets are from Asda, priced at £2.50 for a pack of 2 fillets. As I’ve already mentioned, we love fish and usually have a good result on the scales if we’ve included some fish in our meals for the week. After all, ‘If it swims, it slims!’ Fish is free and protein, so it’s also ideal for an SP day. Monkfish is a really delicious, firm-textured fish which is versatile for a range of recipes, including our Low Syn Monk Fish Bites with Tartar Sauce. Don’t they look good?! You need to make them, soon! These monkfish medallions are skinless and boneless, so all the prep has been done for you. The flavour is mild and sweet, similar to lobster meat, so these monkfish medallions would be really tasty just pan-fried with some simple seasoning. 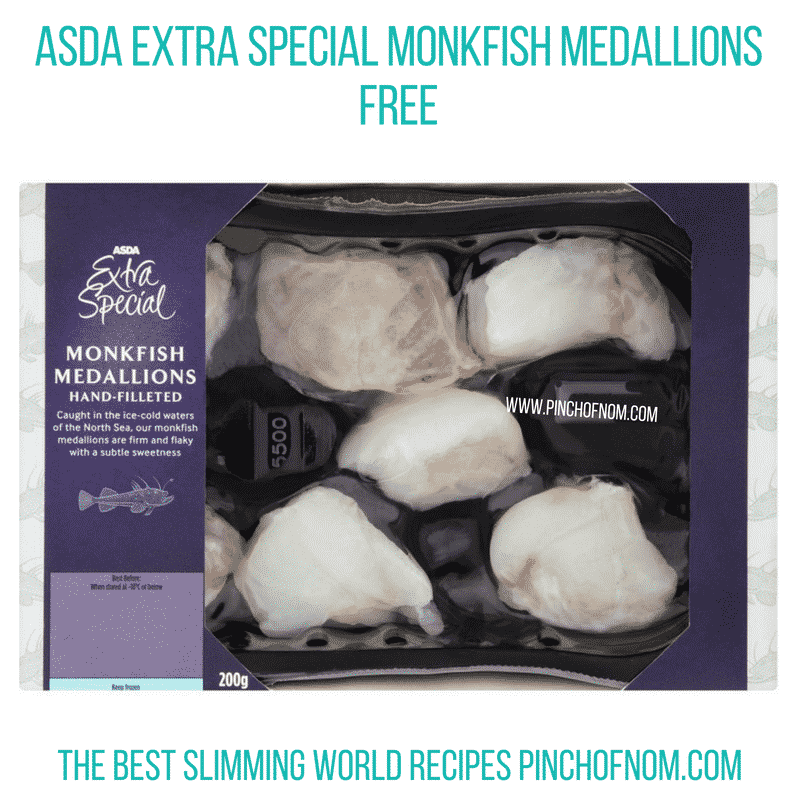 Asda Extra Special Monkfish Medallions are sold in a 200g pack and cost £5.00. Cooking a joint of meat in your slow cooker gives it a fall-apart tenderness that just can’t be matched. If you match it with some great flavours while you cook, you can create a gorgeous meal. 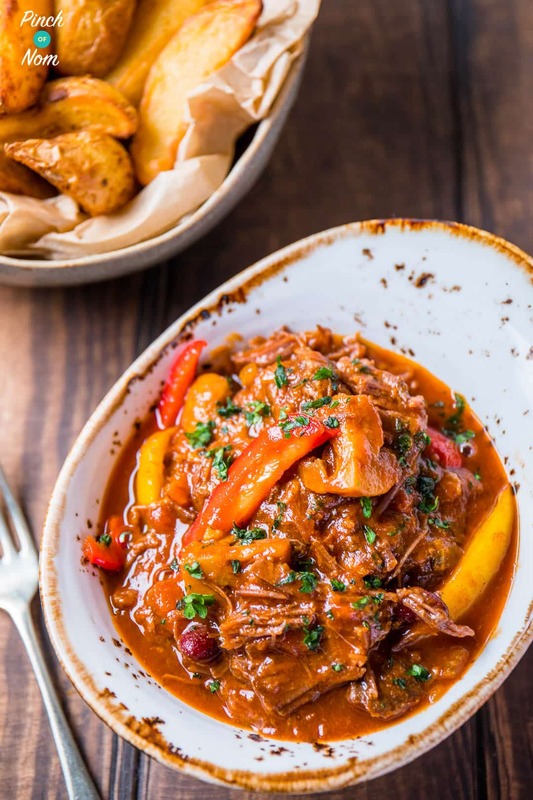 A great example of this is our Syn Free Mexican Chilli Beef – a fantastic slow-cooked shredded beef recipe that’s full of flavour and packed with speed food too. 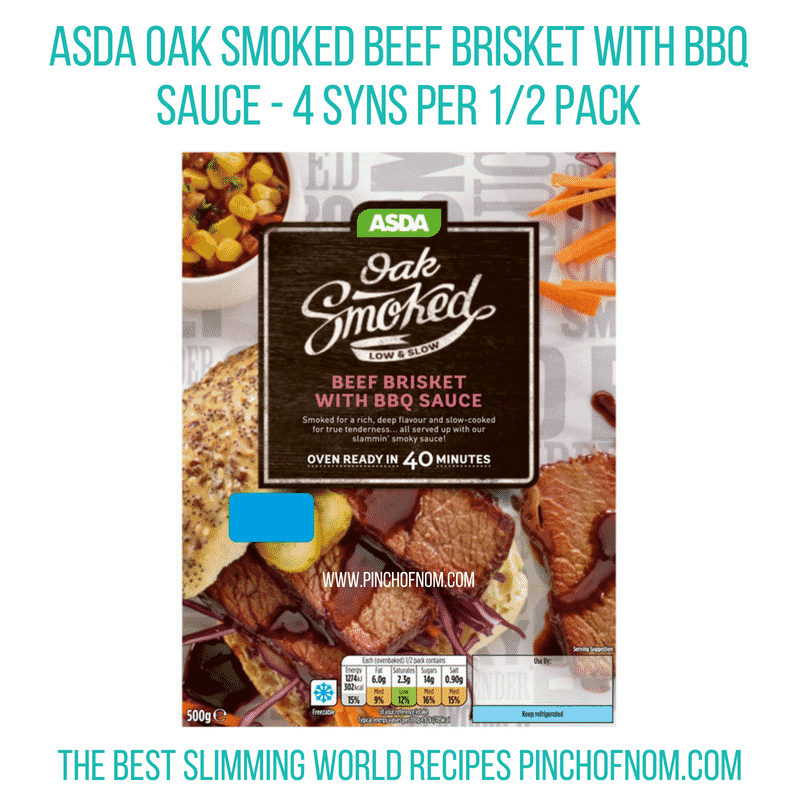 Asda have created this Slow cooked oak smoked beef brisket in a smoky marinade with a barbecue dipping sauce. 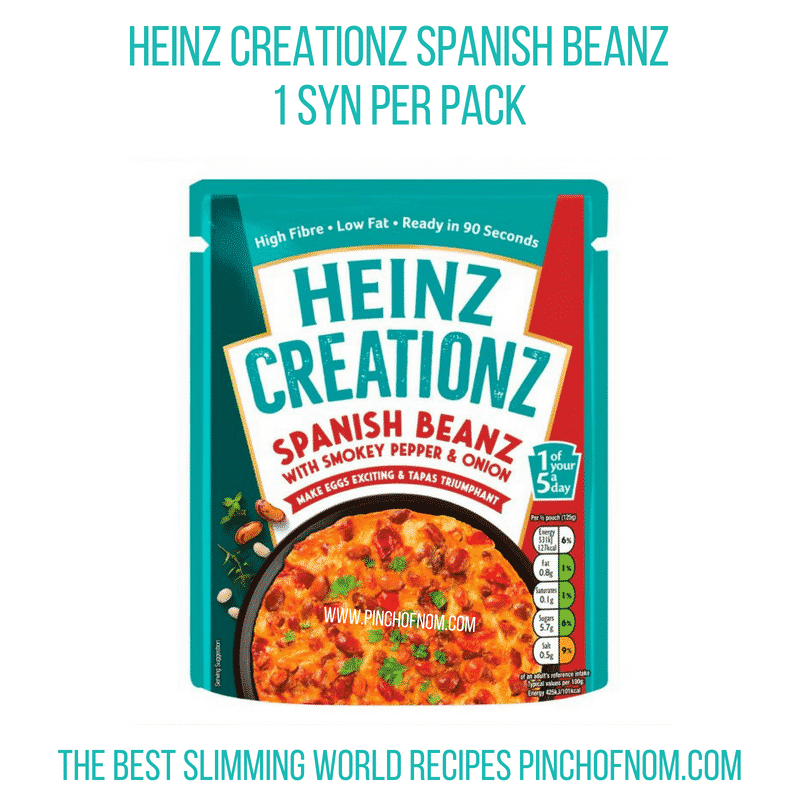 The Slimming World website lists this at 4 Syns per half pack. The serving suggestion includes corn on the cob, barbecue beans and sweet potato fries. We can help out there, with our Syn Free Sweet Potato Fries recipe. This Asda Slow Cooked Oak Smoked Beef Brisket with BBQ sauce costs £4.50 for a 500g pack. Continuing the slow-cooked meats theme, Asda have also launched this yummy sounding oak smoked turkey breast with a BBQ dipping sauce. 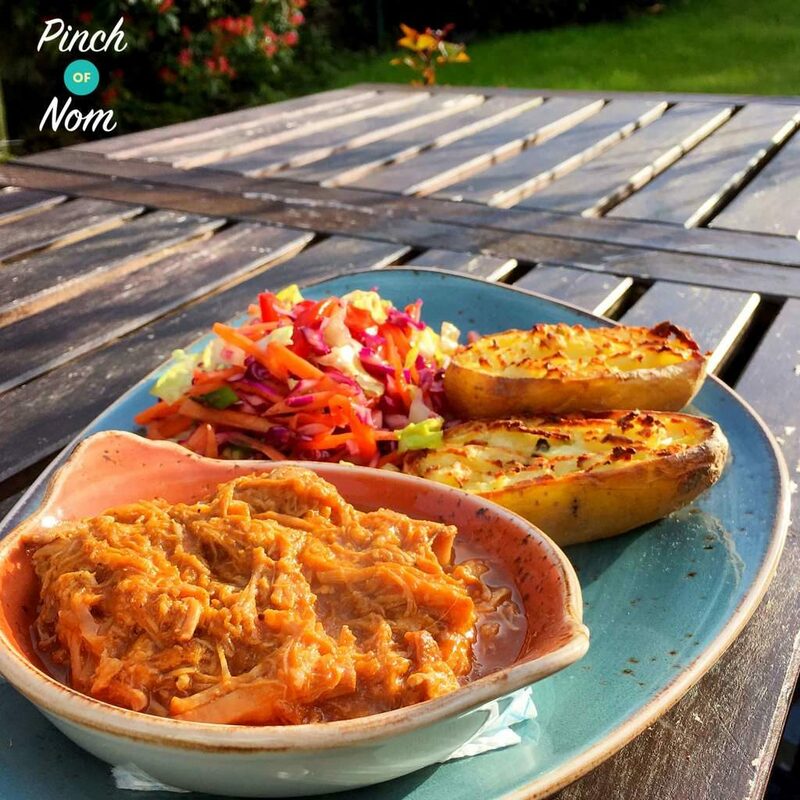 If you love smoky flavours you should try our Syn Free Pulled Pork with BBQ sauce. Of course, you don’t need to use pork. 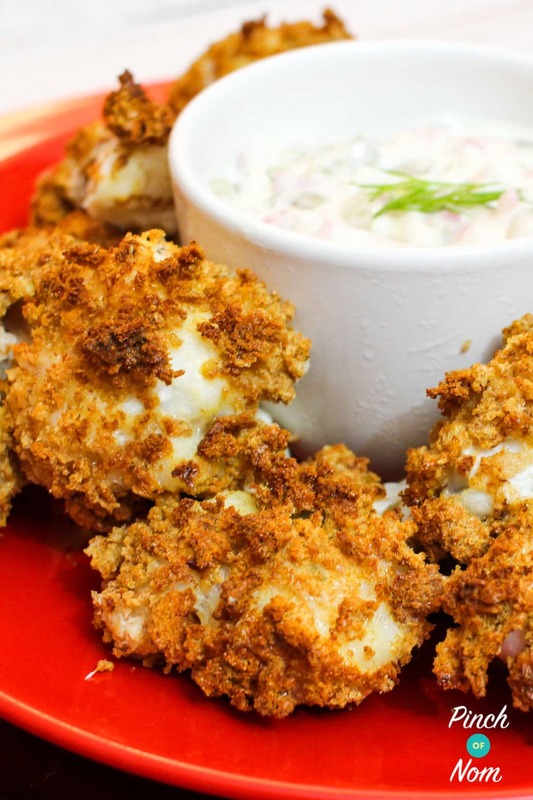 Lots of people have made this recipe using chicken, too! Asda Oak Smoked Turkey Breast with BBQ Sauce isn’t on the Slimming World database yet, but using the Syns calculator it works out free per half pack, which is the suggested serving size. The 390g pack costs £4.00. Questions about rice pop up quite often in the Facebook group. Dried rice is free, whether it’s long grain, short grain, basmati, arborio or any other variety. Frozen rice is usually free, but you still need to check ingredients carefully for added oil. 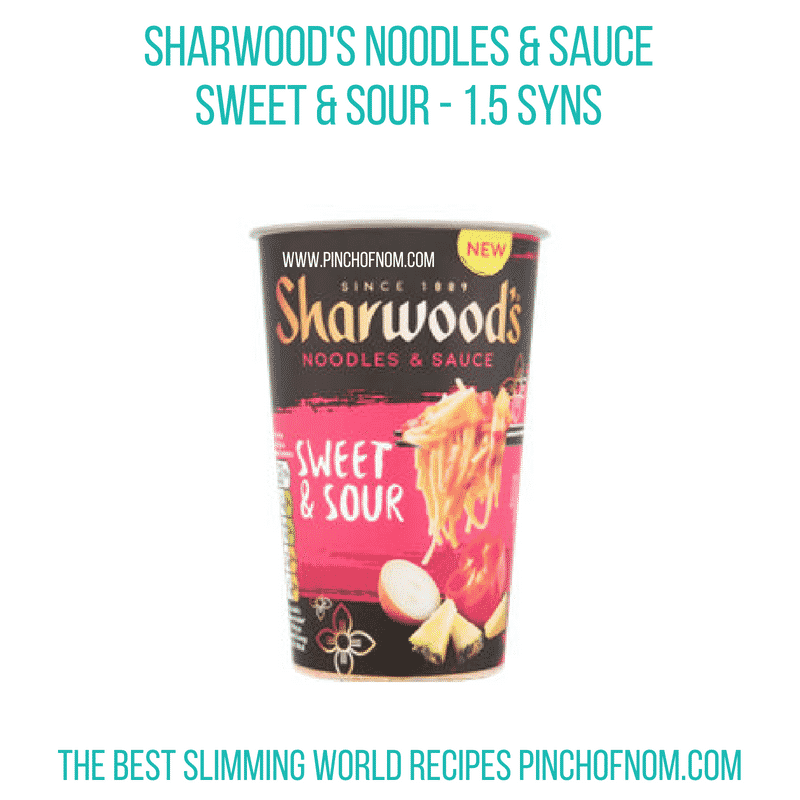 If in doubt, check Syns Online! 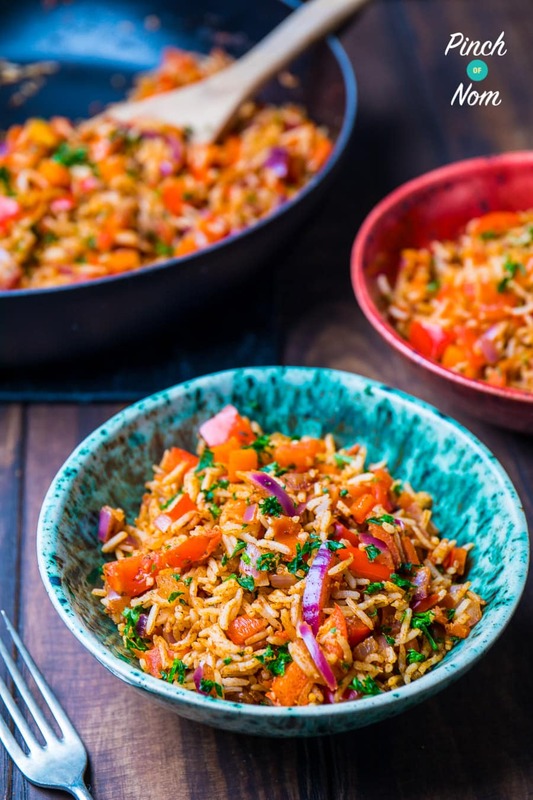 My current favourite rice dish is this Syn Free Indian Fried Rice – perfect with a Fakeaway meal. If you fancy a Fakeaway this weekend, take a look here! 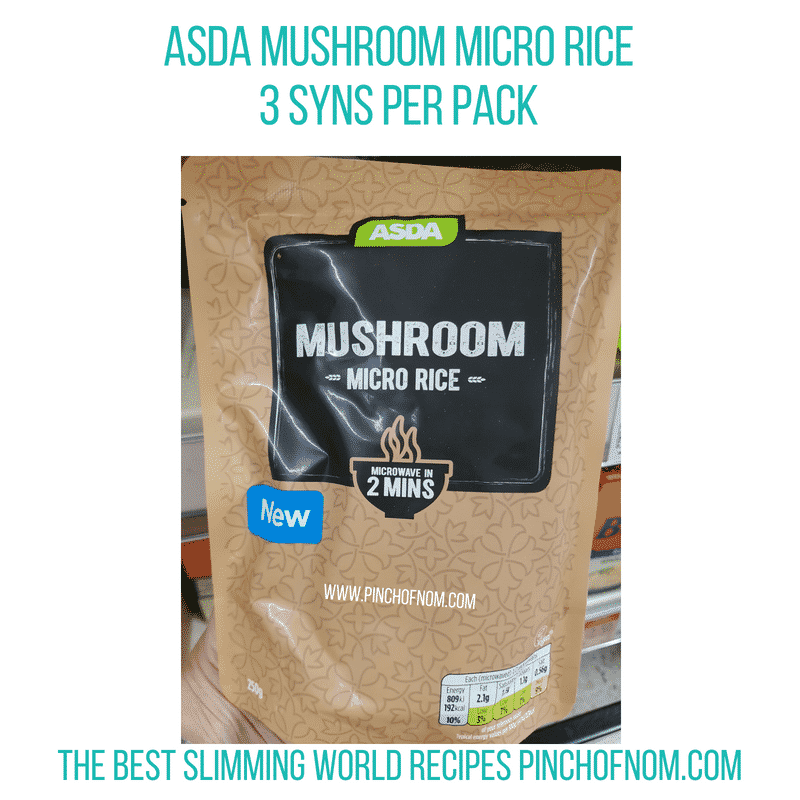 Other forms of rice will usually need to be checked on the Syns database, as they contain oil and flavourings so they’re not Syn free. Packets and pouches of flavoured rice will almost always have Syns, although there are the odd exceptions to this. You can heat the rice in the microwave, or tip into a pan on the hob. 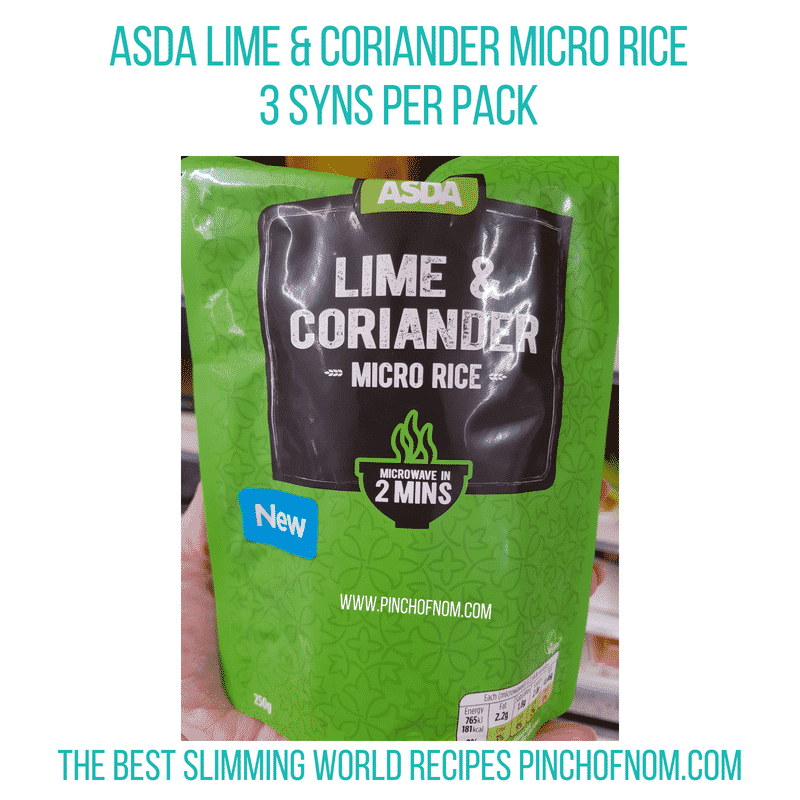 The flavours featured here are 3 Syns each and they cost 59p per pack in Asda. We’re big fans of noodles! 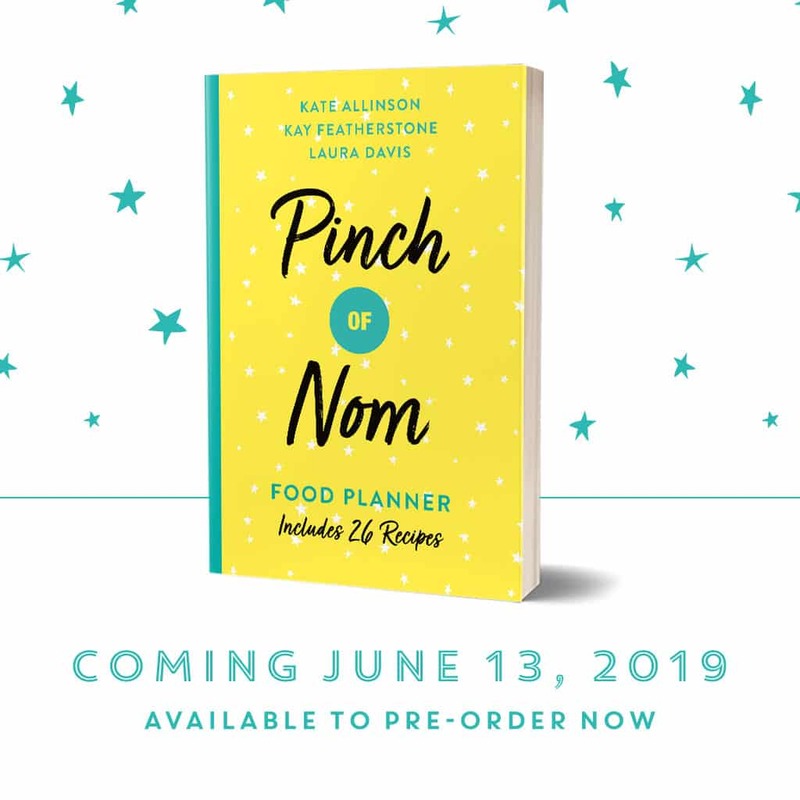 They’re a great way to bring a different twist to mealtimes and make a change from standard pasta and potato accompaniments. 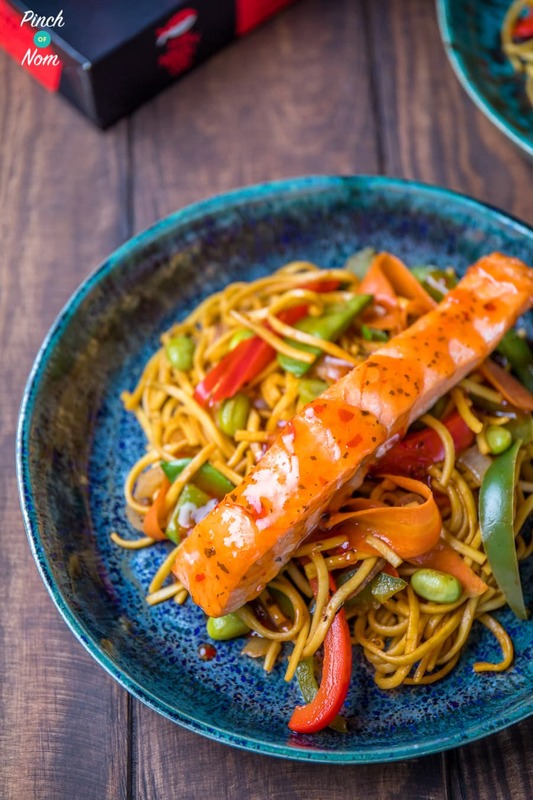 One of my favourite dishes is this Low Syn Ginger, Chilli & Lime Salmon with noodles. 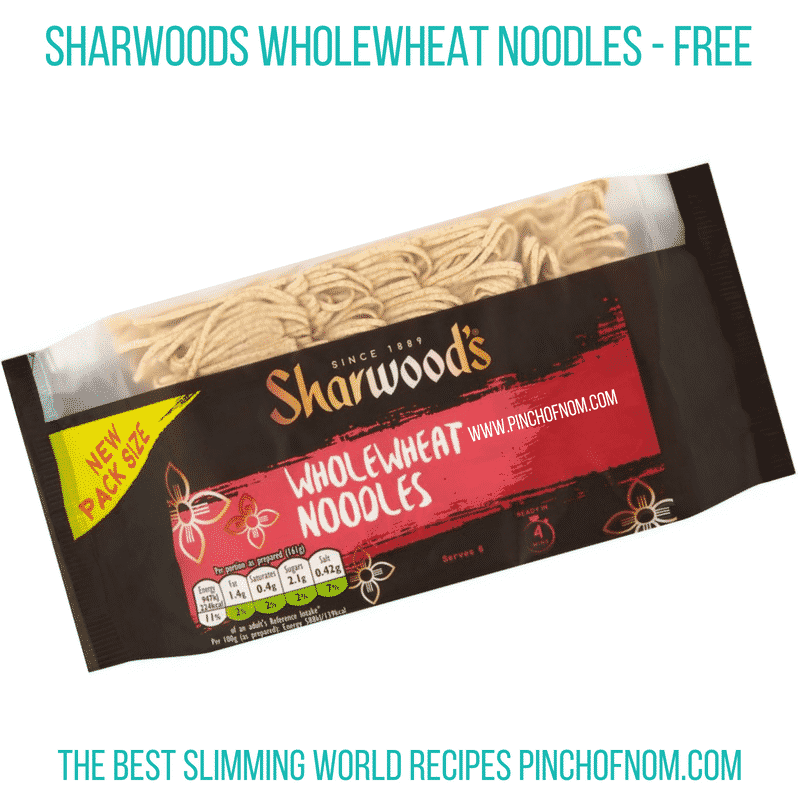 Dried noodles are free on Slimming World, so they’re ideal in recipes like this, and these wholewheat noodles will provide that little extra bit of fibre, too. This new 375g pack size is available from Asda, priced at £1.80. 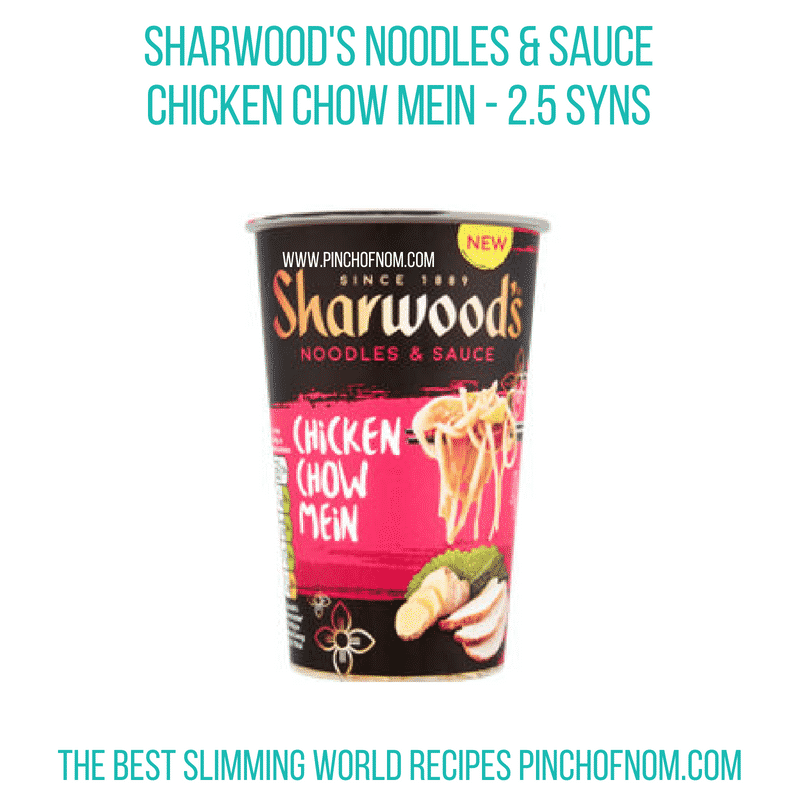 At the beginning of 2018, Slimming World announced that the Syn values of instant noodle and pasta pots/sachets would be changing. 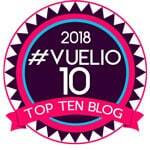 At the time, we wrote an article explaining those changes, which you can read here. Many people use the instant noodle/pasta pots as a quick lunch option, particularly handy if you’re at work and don’t have access to food reheating facilities. Some of the instant noodle and pasta pots are hugely disappointing. Sharwoods is an established brand, so we’re hopeful that these will be more impressive. All three flavours are available in Asda, priced at £1.00 per pot. The prolonged heatwave that we’ve had this summer has meant looking at lots of ways to stay cool and stay hydrated. It’s really important to drink plenty during warmer weather. In some of our recent Shopping Essentials round ups, we’ve brought plenty of ice creams, lollies and drinks that can be enjoyed within your daily Syns allowance. 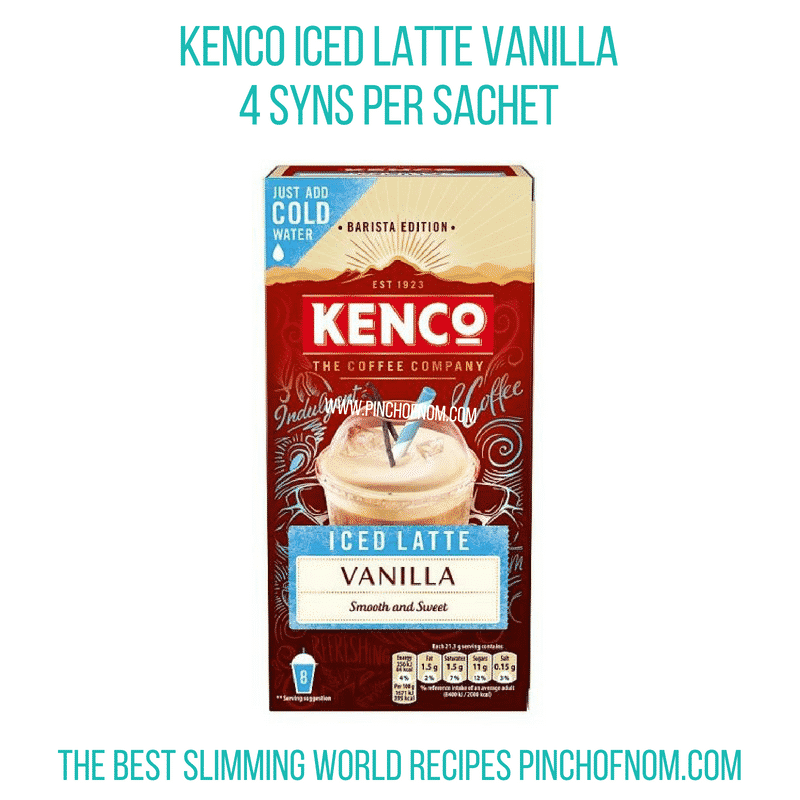 This week we’ve spotted these Kenco Instant Iced Latte sachets. 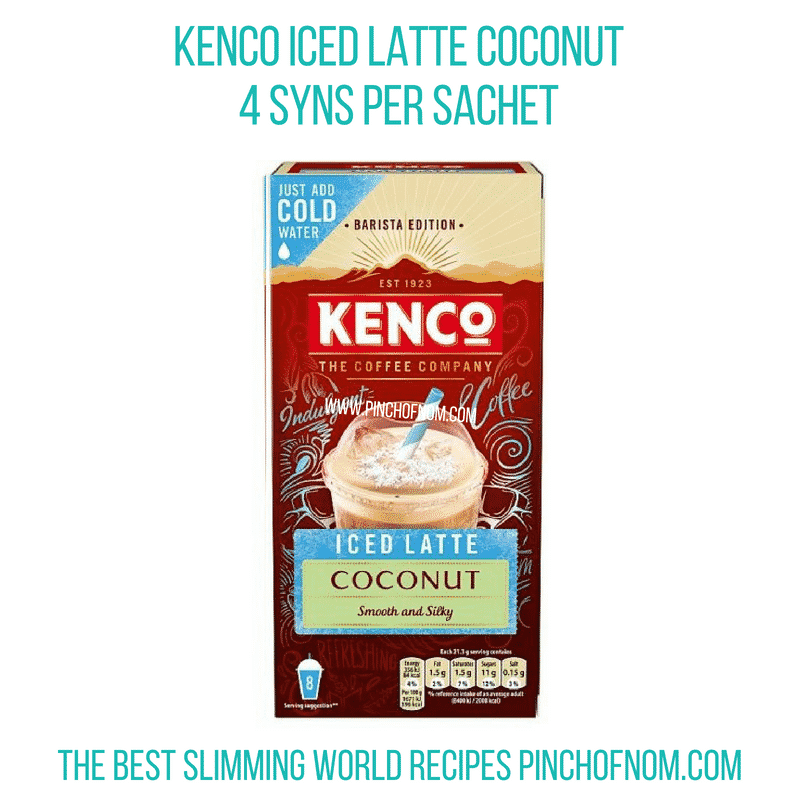 Out of curiosity, I checked Syns online earlier this week to look at Syn values for coffee shop iced latte drinks. 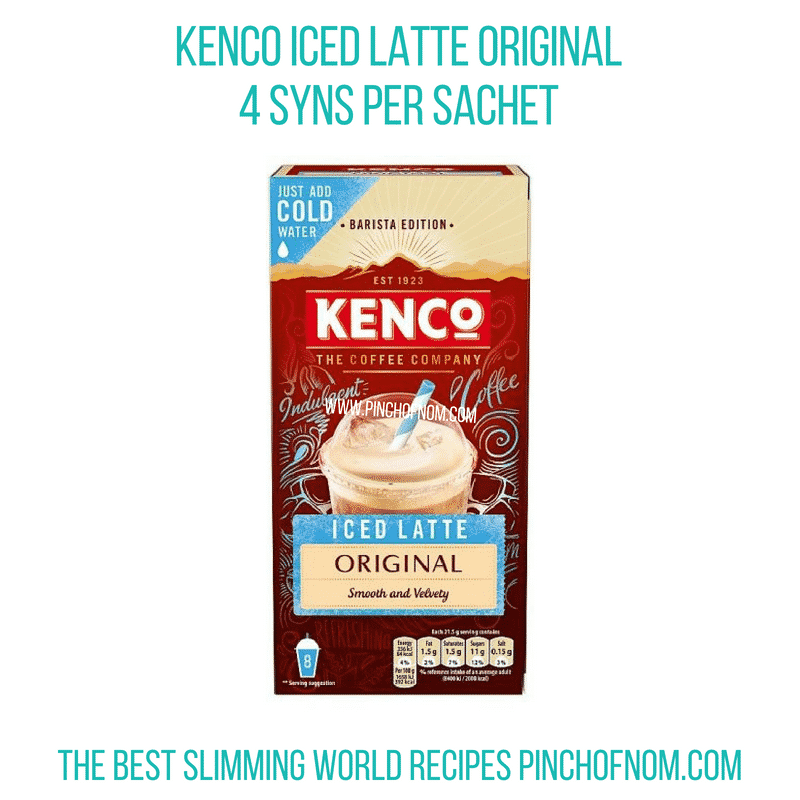 The Syn values can vary enormously, depending on which milk is used, along with the addition of cream or syrup, so these Kenco Iced Latte sachets look like a decent option to save you a few Syns and treat yourself at home. 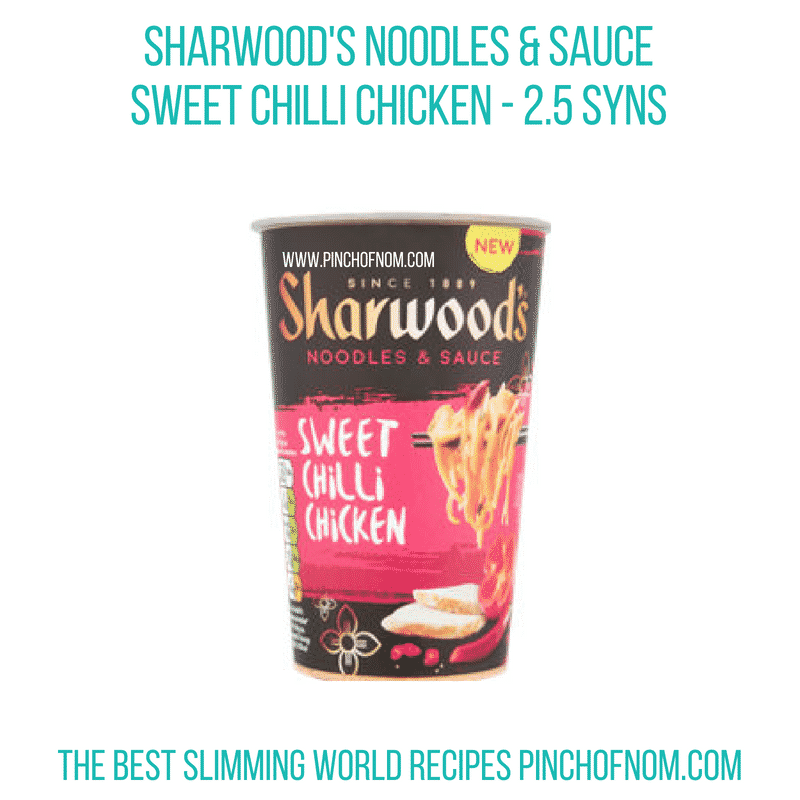 All flavours work out at 4 Syns per sachet using the Syns calculator on the Slimming World website. A box of 8 sachets costs £2.50 from Tesco. You can also find them here, on the Tesco website. 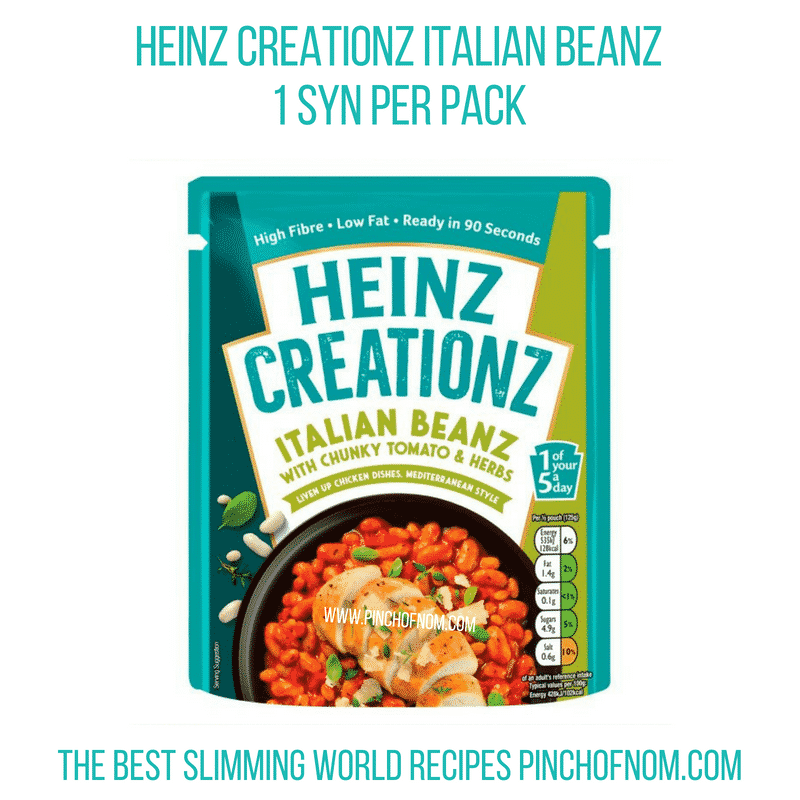 The Creationz range from Heinz has been relaunched. Previously available in 400g cans, they’re now being sold in 250g pouches. 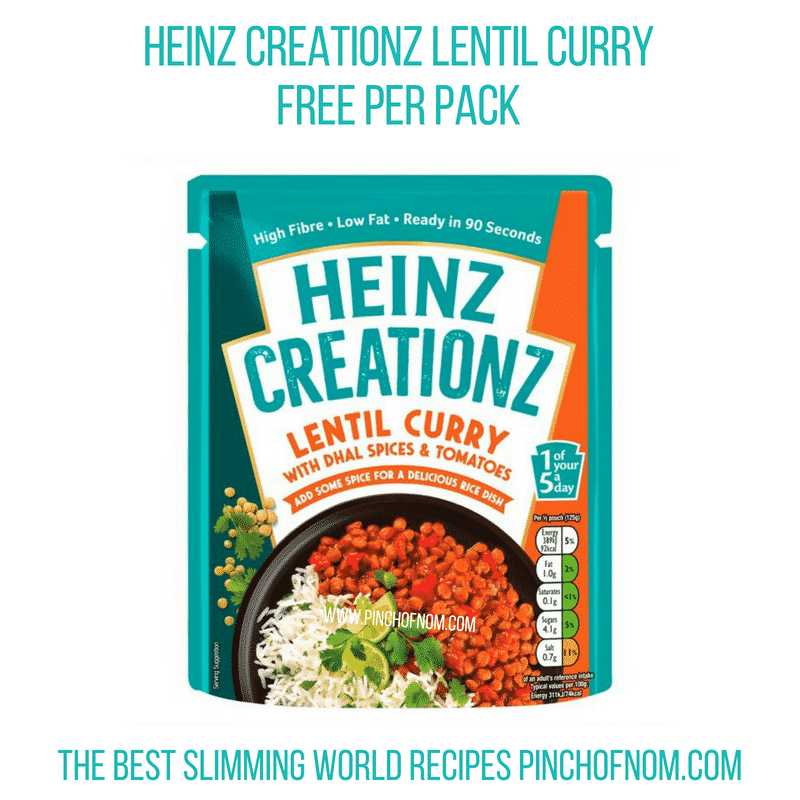 There are three different flavours of beanz and a lentil curry. You might choose to eat these as they are, heated up straight from the packet. You could choose to bulk them out by adding extra speed vegetables to invent your own recipe. Served with rice, pasta or noodles, this would make a filling meal which is pretty low in Syns. The serving size is smaller, and we’re not sure if the recipe has changed, the new Syn values have now been added to the database. 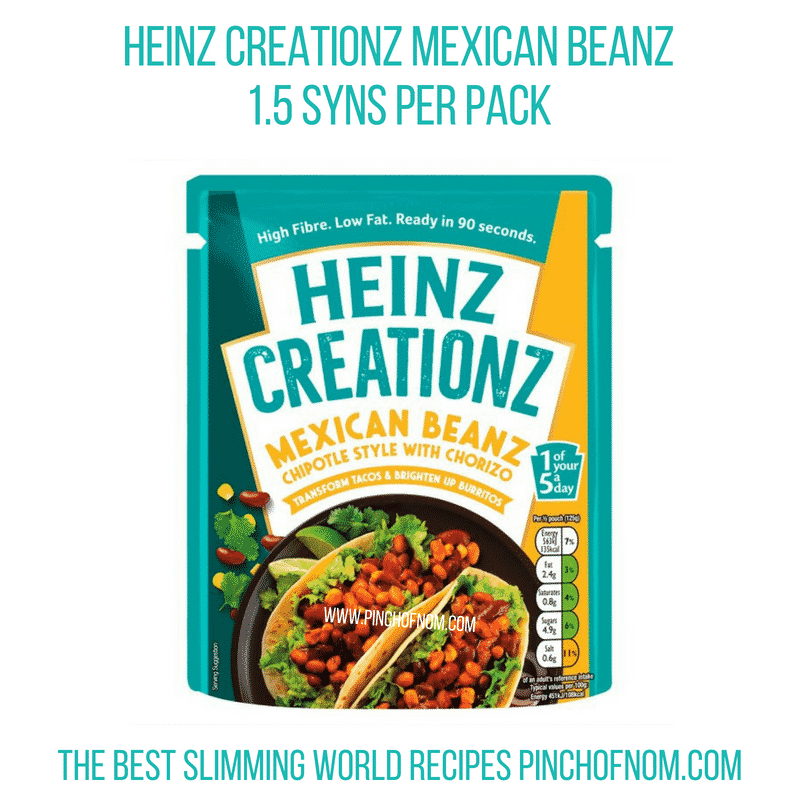 Heinz Creationz sachets are available from Asda and Ocado, priced at £1.75 per 250g pack. Rubicon Spring sparkling spring water with fruit juice drinks have been around in 500ml bottles for quite a while now. They’re listed as free on Syns Online too, which is always good to hear! Asda are now selling Rubicon Spring in 1.5 litre bottles, in fact I’m working my way through a bottle of the Black Cherry Raspberry flavour as I write this article! It’s my favourite flavour, but my children prefer the Orange & Mango variety. I haven’t tried the Strawberry & Kiwi flavour yet, but I’m sure it’s just as tasty. There are rumours that a Lemon and Lime flavour is going to be launched soon, but we haven’t found it yet. You’ll be the first to know if we do! 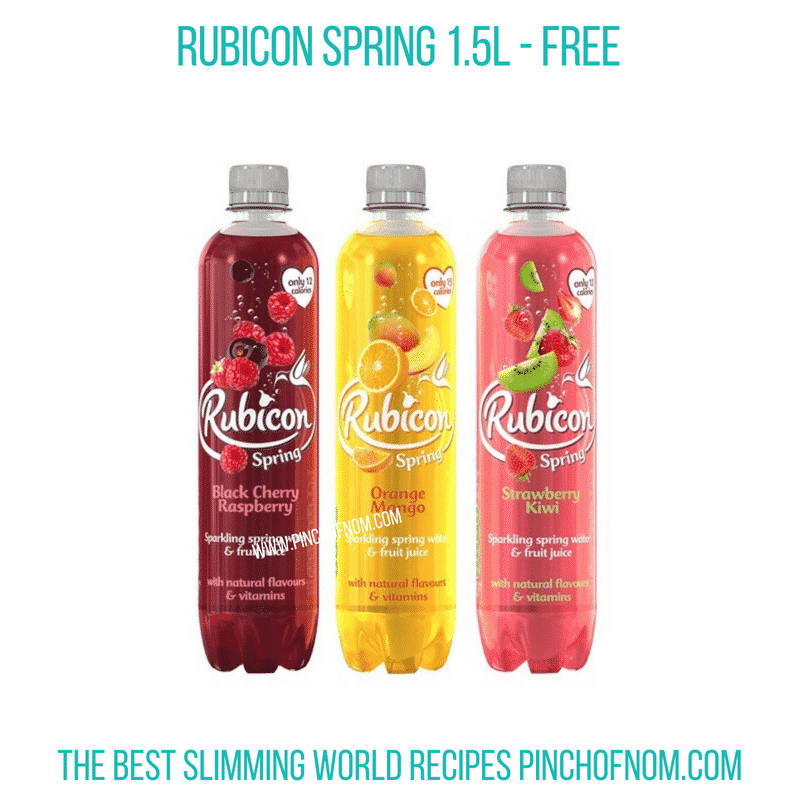 Rubicon Spring 1.5 litre bottles are in Asda now, priced at £1.00. You might have seen or heard Gary Lineker promoting the latest offering from Walkers on the TV this week. I spotted the advertising campaign a couple of nights ago. Poppables are shaped 3D potato snacks with a light and airy texture. They come in three flavours, BBQ, Sweet Chilli and Cheddar Cheese. 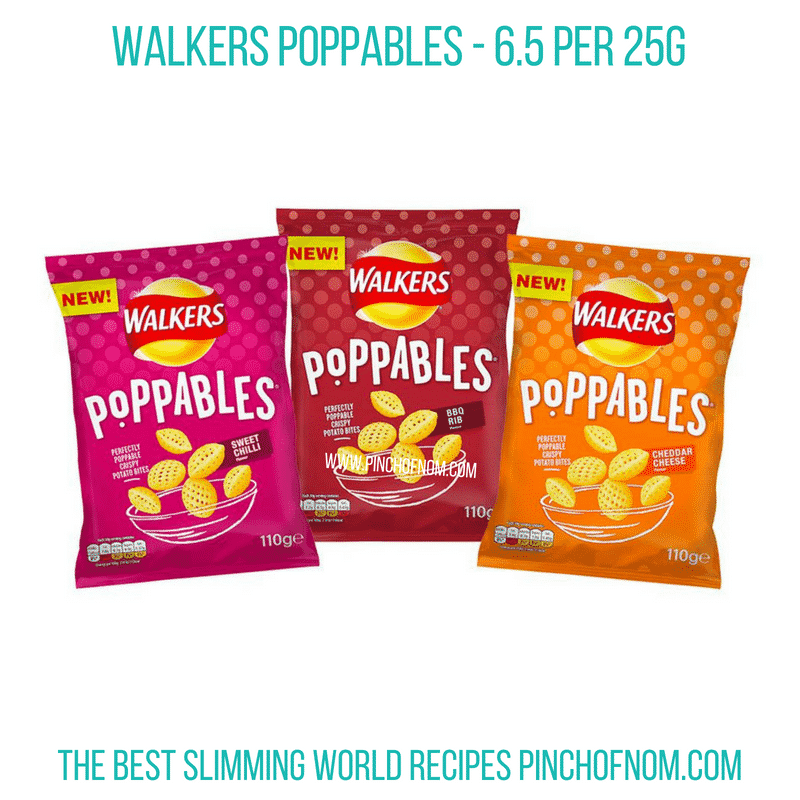 A 25g serving of Walkers Poppables is listed on Syns Online as 6.5 Syns. Tesco are selling 110g sharing bags for 99p until 14.8.18, when they’ll return to their normal price of £1.99. You can find them here, on the Tesco website. If you regularly lurk in the crisps and snacks aisle of your local supermarket, you’ve probably spotted these new Hula Hoops Flavarings. Available in three flavours, Salt & Vinegar, Spicy or Tangy Cheese, Hula Hoops Flavarings are crispy and light savoury snacks with a melt in the mouth texture. They have no artificial colours or flavours and are free from MSG. They’re also suitable for vegetarians. 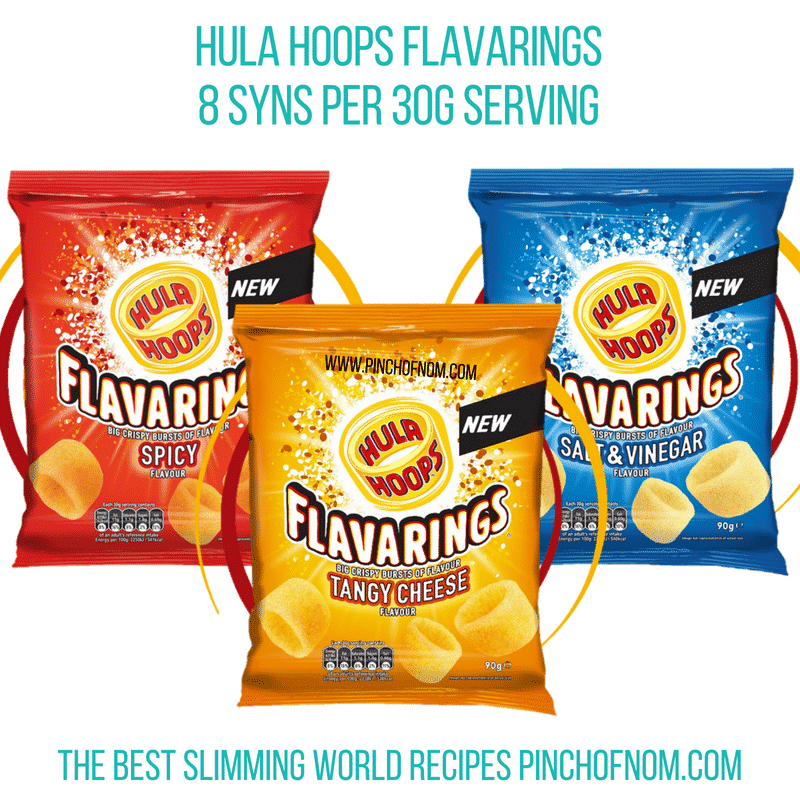 Hula Hoops Flavarings are listed on Syns Online as 8 Syns for a 30g serving. 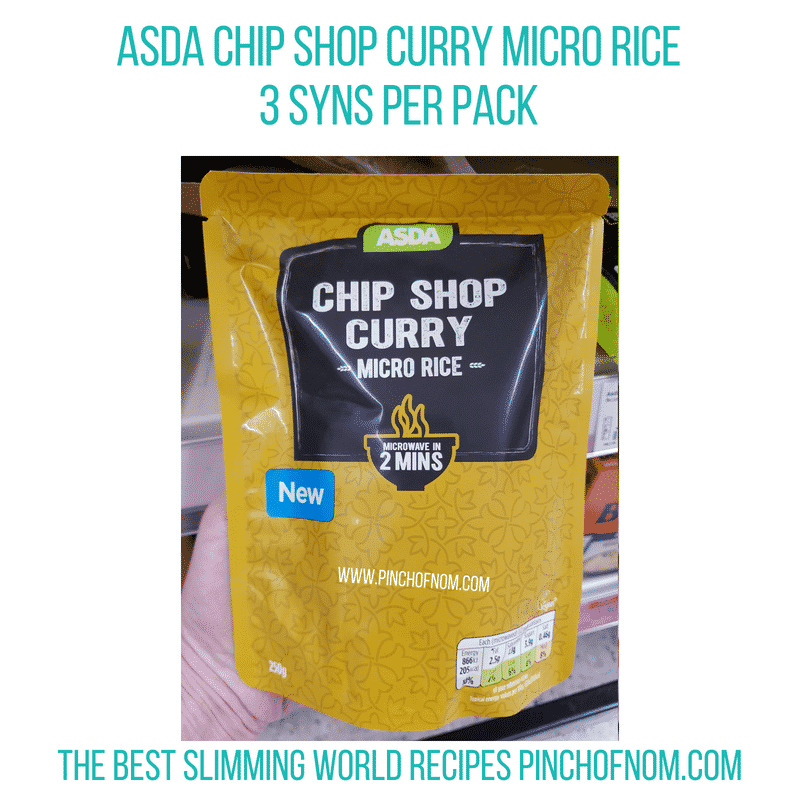 A 90g bag costs £1.00 from Asda. Yazmin shared a photo of these in our Facebook group this week, so I felt duty-bound to investigate further! These are really good value, Syns wise. 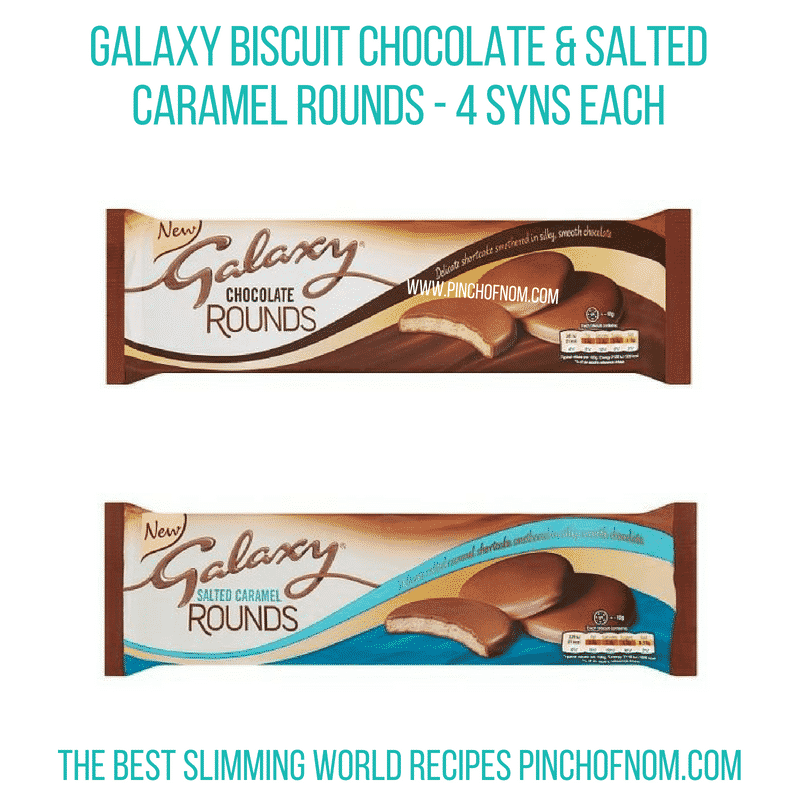 Rounds of shortcake, or salted caramel shortcake, smothered in silky smooth Galaxy chocolate, all for just 4 Syns each on the Snackulator. So far these are available from Asda and Tesco, priced at £1.99 per pack. You can find them here, on the Tesco website. 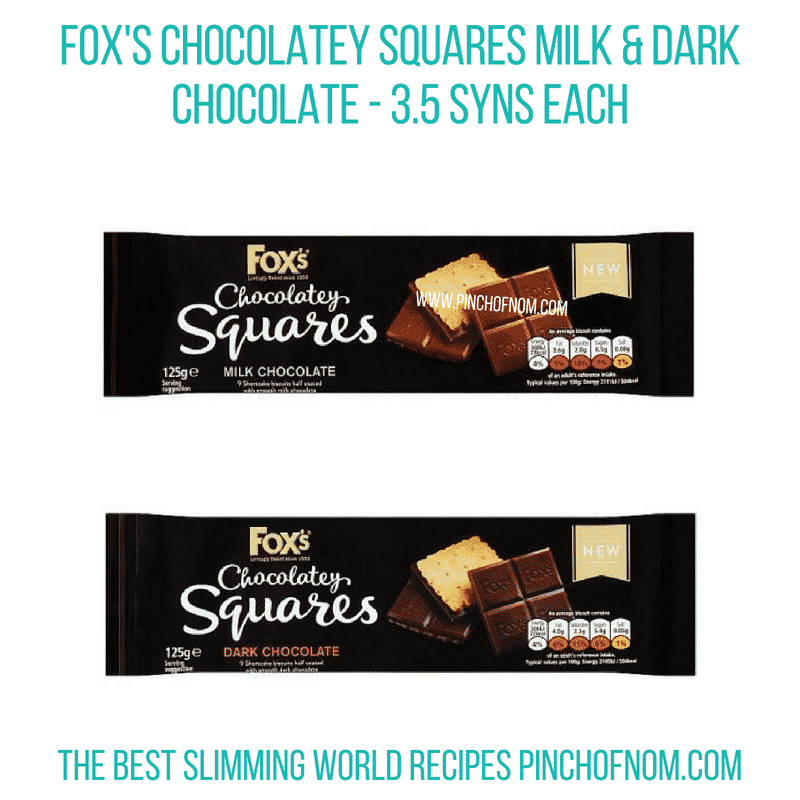 Whilst I was investigating the Galaxy Rounds in Tesco this week I also spotted these Foxes Chocolatey Squares. I was in my chocolatey element! Just like the Galaxy biscuits, they are sweet shortcake biscuits, but these are half-coated in either milk chocolate or dark chocolate. They’re not on Syns Online yet, so we’ve used the calculator to work these out at 3.5 Syns per biscuit. Tesco are selling them for £1.50 a pack. You can also find them here, on the Tesco website. After Eights are a classic combination of mint with dark chocolate, perfect as an after dinner treat. The original After Eights are a thin slither of dark chocolate, filled with mint fondant, sitting in a paper envelope and waiting to be devoured. These are little bite-sized chocolates with the same minty filling, in a handy sharing pack. We’ve used the snackulator to work out that you can have 6 After Eight chocolates for 7 Syns. 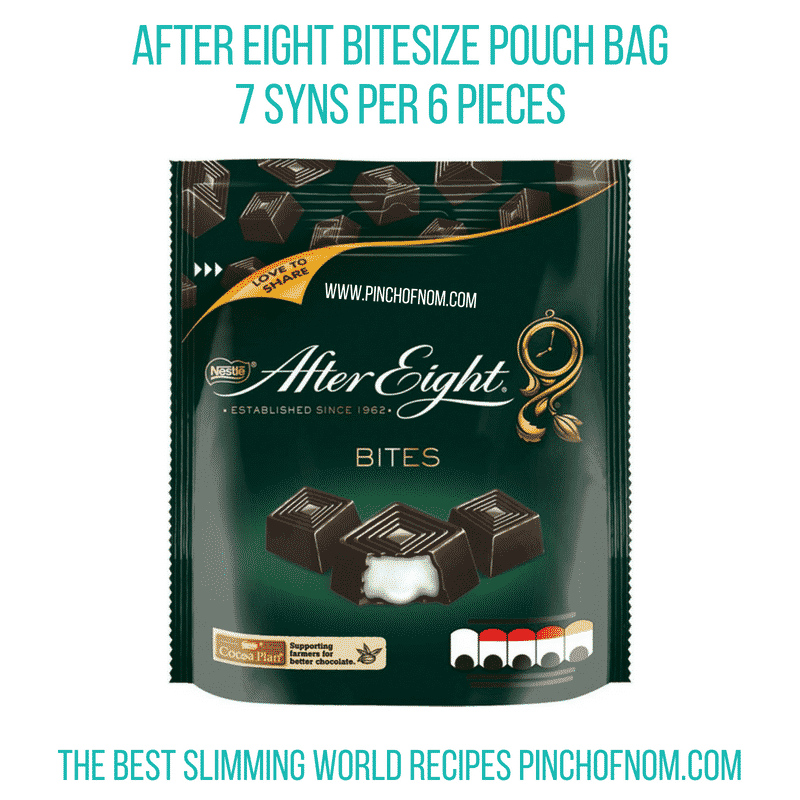 The After Eight Bitesize chocolates come in a 107g bag, priced at £1.50 at Sainsbury’s. Ooooh, that’s good to know! Hopefully they’ll be rolled out to supermarkets soon! 🙂 Thanks for getting in touch. Thank you for the lovely comments! It is a lot of hard work but it’s great to know that it’s appreciated! Many thanks.